Desert dwellers know that living sustainably in the Sonoran Desert takes wisdom along with respect for plants and animals that have adapted over time to thrive in the desert. PDEQ is collaborating with many local organizations on a Desert Dwellers Education Project for teachers, students, librarians and the general public to enjoy. The first segment of this multi-faceted project was to create and distribute an eye-catching poster to celebrate Byrd’s words and our desert home. The second phase of this project, the inspirational and educational coloring/activity book, is now ready for distribution. 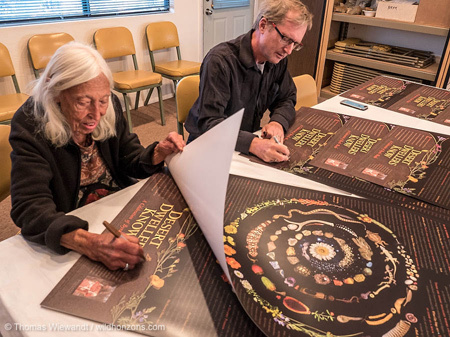 The Desert Dwellers Know educational poster and coloring/activity book inspire appreciation for and conservation of the Sonoran Desert through the poetic insights of Byrd Baylor, the well-loved children’s book author and winner of four Caldecott Honor Awards. Byrd’s gems of wisdom were chosen because she expresses key desert conservation messages beautifully. The Sonoran Desert is a very special place we call home. As Byrd says, we need to “…treat it well – the way you would treat an old friend,” so desert life can continue to thrive. The mandala-styled artwork for the poster, was crafted by local nature artist, Paul Mirocha, and is inspired by ancient Hohokam petroglyphs on Tumamoc Hill. 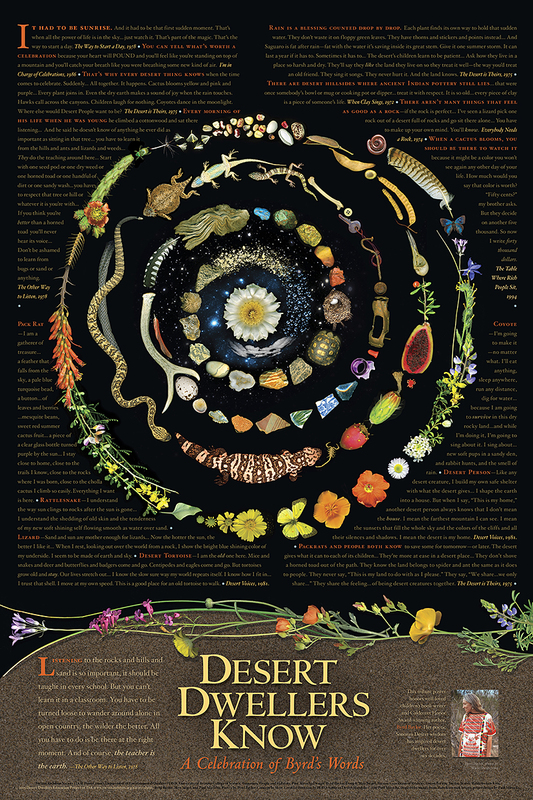 The beautiful spiral image presents Sonoran Desert plants and animals along with found objects from today and generations past. Byrd’s words and Paul’s imagery honor where we live and combine literary and visual arts with cultural and biological sciences. PDEQ and collaborating educators are exploring potential STEAM (Science, Technology, Engineering, Art & Math)-related educational activities to tie with the poster’s message and elements for ease of incorporation into the classroom. The coloring/activity book was designed by Karin Mellin, artist and Principal of K.Mel Designs. Karin's artwork combines elements of the poster with fanciful and true-to-life depictions of desert landscapes, plants and animals. Byrd's words are infused throughout the drawings to inspire actions that desert dwellers can take to protect the ecological health of our shared desert home. On each page, PDEQ staff added thought-provoking inquiries to help connect the art and poetry with ideas to embrace resilient Sonoran Desert wisdom and integrate protective actions into our daily lives. There are also pages of resources for parents and teachers to support STEAM and Arizona Academic Standards at home or in the classroom. The poster is available for purchase at the Tucson Audubon Society’s Nature Shop (520.629.0510, x7015; www.tucsonaudubon.org/nature-shops), Antigone Book Store (520.792.3715; www.antigonebooks.com) and Old Town Artisans Art House Centro (520.620.1725; www.oldtownartisans.com/) . Proceeds from the sale of the poster will be used for environmental education projects, including additional printings of the coloring/activity book and the development of Desert Dweller Treasure Trunks for loan to classrooms and libraries. Numerous local organizations and individuals have embraced this project to enhance community wellness and vitality by generously providing in-kind or financial support including the Tucson Audubon Society, Tucson Water, Tucson Association of Realtors Green Forum, University of Arizona College of Science, Bahti Indian Arts, AZ Litho, Pima County Public Library, Paul Mirocha Design, K.Mel Designs, Southern Arizona Environmental Management Society and Byrd Baylor, herself. PDEQ staff have been interviewed by Dan Laut of KXCI Community Radio, Edible Baja Arizona magazine, The Desert Leaf, and The Tubac Villager. Please visit the Edible Baja Arizona blog Desert Dwellers Know: A Tribute to Byrd Baylor, and the KXCI blog post and/or listen to the interview to learn more. If you would like additional information about the project, please contact Skye Siegel, PDEQ Program Coordinator, via e-mail or at 724-7447.